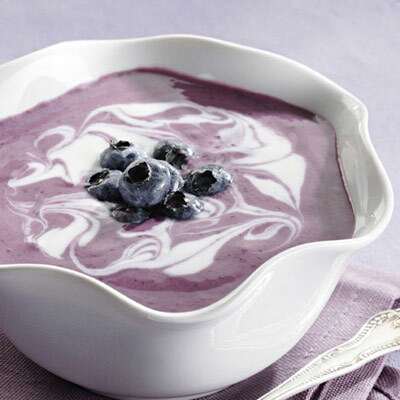 Delightful and refreshing, this chilled soup works as an appetizer, dessert or snack. If using frozen blueberries, cover the pan in Step 1 to bring the cold blueberry mixture to a boil more quickly. Whisk cornstarch and milk in a measuring cup until smooth. Whisk into the blueberry mixture. Bring the soup to a boil over medium heat, stirring. Boil, stirring constantly, until the soup thickens slightly, about 1 minute. Remove from the heat and let cool for 10 minutes. Transfer to a bowl, loosely cover and chill until cold, at least 5 hours or up to 2 days. Just before serving, whisk 1 cup sour cream into the soup and ladle into bowls; top each serving with 1/2 teaspoon sour cream and swirl decoratively into the soup. Garnish with additional blueberries, if desired.